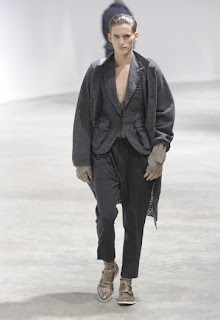 The last two weeks in fashion saw the menswear collections for fall 2010 in Milan and Paris. In Milan, Versace paid homage to it's founder Gianni Versace with inspiration from his signature collections of the nineties. Models paraded the runway in combat style clothing with a futuristic look the way only Versace could do it. Tight leather pants, metal, studded jackets, motorcycle influences and patent leather were in almost every ensemble. Paris saw Dior's collection continue with the tradition of luxury menswear. The standout pieces were the floor grazing coats, neatly tailored trousers and simple lapels. Paul Smith made sure to infuse his British sense of tailoring while making sure to represent the modern man. He showed pea coats, check patterns and sport coats. Lanvin pushed the envelope with his street-wise, edgy collection aimed at a more daring man. Sleeves on jackets were chopped, unfinished seams, knitwear combined with nylon and nipped waists.